What’s New About 3Tesla MRI? Everything. Savings result from experience. Even today, many health care providers do not fully appreciate the benefits of higher tech MRI studies. We love to answer doctors’ questions. For instance, we found a patient with marrow abnormalities on a lumbar MRI. In addition to being like a CT scan image, MRI shows vascular structures and bone marrow much better than CT scans. The abnormality we found was not seen on x-ray. The doctor asked if a bone scan would add any information. The answer was NO. We saved the patient $900 dollars because the doctor asked a question. Doing the bone scan would have given us no useful additional information. Dr. Chao has 30 years experience which can help you and your doctor save money. We love to save money. Our health care is inefficient, in part because not enough people and doctors ask questions about how to save money. We have been committed to providing the highest quality MRI technology since 2007 when MRI Consultants opened its doors with the First 3T MRI in the First State. A recent review article in Medscape, (http://www. medscape.org/viewarticle/776272), completely turns everything we know about MR imaging upside down. We offer diffusion tensor imaging and want to do resting state fMRI exams. These exams are useful in patients with both Parkinson’s disease and autism. There are new techniques in imaging—3T MRI, MR spectroscopy, diffusion tensor imaging, DWI and perfusion imaging—all of which are better than the routine post-contrast MRI study for lesion margin evaluation. Our new office in Lewes has offered these techniques since 2011. We have the technology and Dr. Chao has 30 years experience, which was recognized by his peers. Delaware Today magazine 2012 listed Dr. Chao as a Top Doc in Radiology. But it is all about being reachable by phone. 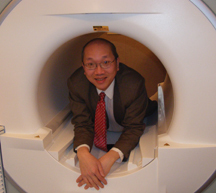 Dr. Chao’s desire to provide the most advanced MRI imaging possible had led us to offer services other facilities do not. 32-channel head coil high resolution studies—performed at our 3T Lewes MRI site. We are the only facility in Delaware (and possibly the entire Delmarva Peninsula) with a 32-channel head coil. The extra channels translate into better and faster brain imaging. The 32-channel coils themselves are extremely rare. Even in world capitals like Paris and NYC, only one or two facilities have such high resolution coils. MRA’s can be done at super high quality in only 4 minutes. Quantitative MRI can measure white and grey matter and CSF. Diffusion Tensor Imaging picks up subtle brain trauma, Alzheimer’s and even autism. Proton spectroscopy helps do a non-invasive biopsy (we do this for free) if the test might show a stroke or tumor. This is useful information which costs nothing if you come to us for your MRI study with contrast—we just add the 5 min scan for free. Prostate MRI which, at 3T does not require the insertion of an invasive probe/coil. We do spectroscopic exams for no additional fee because Dr. Chao wants to help patients. Many facilities (if equipped to perform the test) charge up to 100 dollars for the same exam. 3T Breast MRI is 100% sensitive for breast cancer. We do a special lymph node detection sequence called DWIBS. This can change your diagnosis up to 30% of the time. It even adds lymph node detection without using IV contrast. We offer a super high quality abdomen study for $500 that is able to pick up smaller pancreatic cancers, smaller liver cancers and includes diffusion weighted imaging for free. This new technique is up to 96% sensitive for cancer. Ask us about our Out-of-Pocket discount $700 for studies that use safe contrast. We understand that some patients suffer from claustrophobia. For those patients who know themselves to be extremely claustrophobic, we offer IV valium conscious sedation (we are the only providers that do this) for the modest fee of $50—provided they have someone to drive them home afterwards! Another development has been in the area of the contrasts used for MRI. While the contrasts used for MRI are very different from those used for CT scans, they are not all the same. Some have been linked to a very rare, but very serious, debilitating and incurable illness called Nephrogenic Systemic Fibrosis (“NSF”). We have always been very careful to select contrasts that have NEVER been connected to NSF. The safer contrasts cost a little more, but you’re worth it! We use Multihance (at 1.5T), Prohance (at 3T) and Eovist (for patients with kidney problems). If you have any questions, please do not hesitate to call Dr. Chao at 302 295-3367 (33MR). We are here to help.